There’s a lot to like about MTV’s live-action adaptation of Terry Brooks’ Shannara book series . But it’s also very much an epic fantasy TV series made by MTV, which begs the question: Who is The Shannara Chronicles really for? Because the show may be too fantastic for normal MTV audiences, but also too MTV-ish for most fantasy fans. 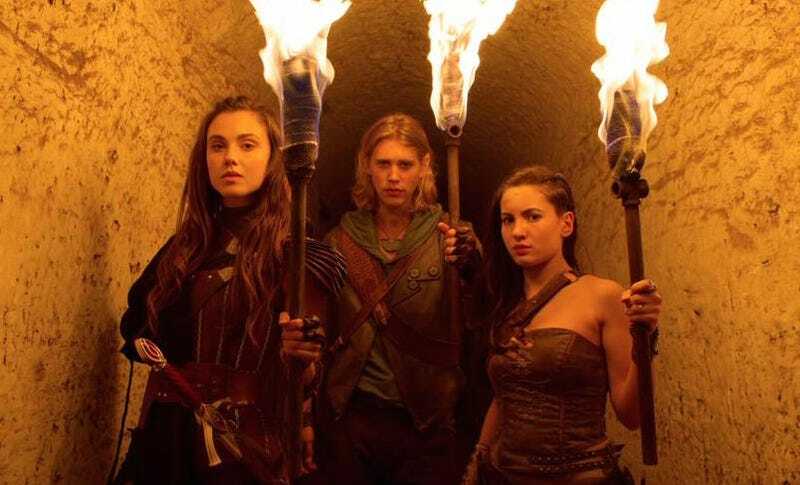 Imagine if Peter Jackson had hired the cast of any of MTV’s current high school dramas to be in his Lord of the Rings movies—that’s The Shannara Chronicles. It’s almost exclusively a collection of extremely attractive young white people who, despite wearing elf ears and being forced to discuss magic stones and demon-imprisoning trees, give zero sense that they’re living in a post-apocalyptic world full of magic. They talk and act exactly as they would, if they were starring in a modern high-school drama. In addition, their outfits tend to be things that look very much like modern jeans, slacks and hoodies. This is very weird—because otherwise the show has gone all out to bring the fantasy realm of Shannara to life. It’s filmed in New Zealand, giving the show the same otherworldly setting that Lord of the Rings had. The CG for the fantasy locations is top-notch, and all the sets are well-designed and well-utilized. The VFX for the magic and monsters also looks above and beyond what I would have expected for this type of basic cable series. The crazy part? Somehow, this dichotomy actually works. My recollection of Terry Brooks’ Shannara series is mainly that 1) it was an extremely generic carbon-copy of the Lord of the Rings, and 2) the characters were flat. But there’s something weirdly compelling about seeing what seem to be utterly normal teens arguing about whether the sacred Ellcrys tree is actually preventing the evil Darda Mor from unleashing his hellish demon army. It even makes sense, in a way, since Shannara is set in the future of Earth; if there was ever a fantasy series where the heroes could act totally mundane and wear hoodies, Shannara is it. If nothing else, this strange combination makes the TV adaptation unique—certainly more so than its source material. But just because you know the story doesn’t mean you can’t enjoy The Shannara Chronicles for what it is: a pleasant adventure series, with a strange sort of charm to it. It may not be the teenage Game of Thrones that MTV was possibly hoping for. But if you’re looking for more elves and magic and demons on TV, you should definitely give Shannara a try. Just keep in mind the elves will probably be wearing hoodies.